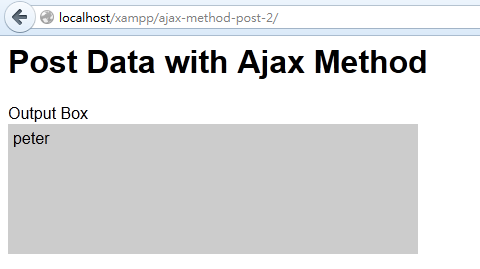 I already discussed how to use jQuery to GET data from external file by using the Ajax method. Let’s play around with the jQuery Ajax method a bit more. Today, I am going to show how to Post data to an external PHP file for processing, and then send back to the webpage. Let’s start with a most basic example. // this will use to send to external PHP file for processing. The above webpage is very simple. 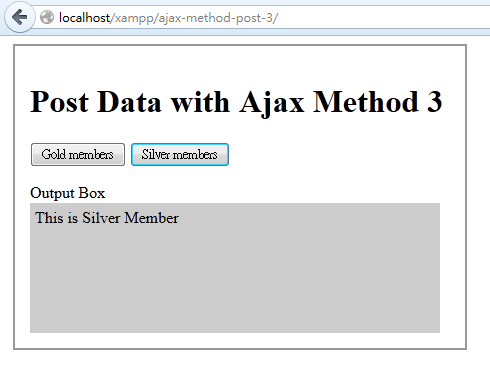 It simply using jQuery Ajax Posting the data (name/value pair) to server (external PHP file – member.php) for manipulation. Let’s see how the PHP file pass the data back to the server (webpage) for further processing. To make thing simple, I will ignore the data first and start with the most basic code structure of the PHP file. I use json_encode() function to pass the value (This is me”) back to the server (webpage). When the webpage is opened, the value (This is me”) received from external PHP file and displayed on the Div layer. The PHP file in example 1 is very simple. It just send a string (This is me) back to the server. Okay! 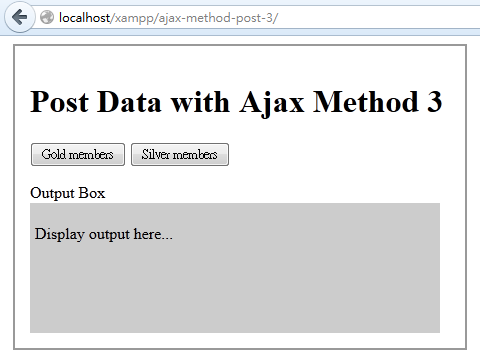 We already got some idea how the jQuery Ajax posting works. Let’s do an example with a little bit more difficult. Don’t worry! It is still very simple. Still remember the name/value pair variable send from webpage? Open the webpage, the value ($member) received from external PHP file and displayed on the Div layer. This concept of manipulating the data is very important. Actually the PHP file will usually do a lot more with the data before sending the results back to the server. 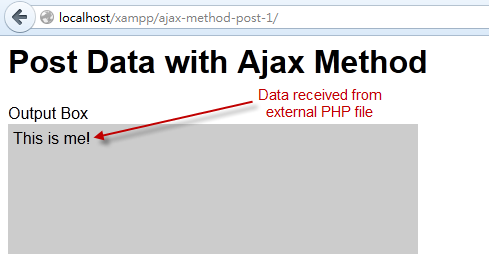 Now we have some basic knowledge of using jQuery Ajax posting data to a PHP file and receive the data back. We can do an example with a little bit more interesting. There are two buttons on the webpage. When users click on the buttons, the corresponding values of the button will post to the external PHP file for processing, and then send back to this webpage, and finally display the value of the button on the Output Box. Here’s the layout of the webpage. Here’s the codes of the webpage. Actually we learned this before in another jQuery tutorial - jQuery Handle Current Selected Element with $(this). Please read the tutorial again if you have no any idea how it works. Here’s the codes of PHP file to manipulate the data. This is very simple, and no further explanation should be required. 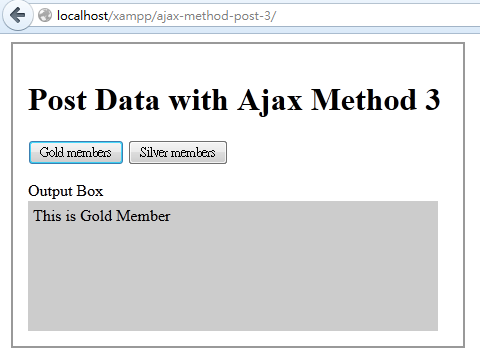 When the “Gold members” button is clicked, the “button=gold” data string is post to the PHP file. The PHP file extract the value from the string, and obtained the value of “gold”. Then send the string “This is Gold Member” back to the webpage. Actually this example is same as example 3. However I would like to change the jQuery codes a little bit. However, some webmasters would like to write a separate function to do that. This can make the main function a bit shorter and cleaner. Let’s combine what we learned in previous post – Using jQuery serializeArray() Method – with this post. 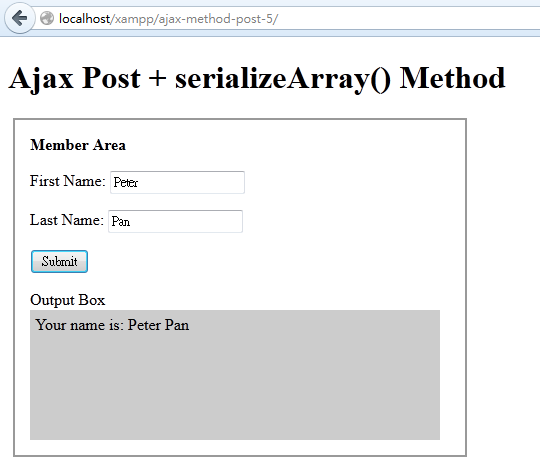 I will try to Post the serializeArray() object by Ajax to PHP file for processing. 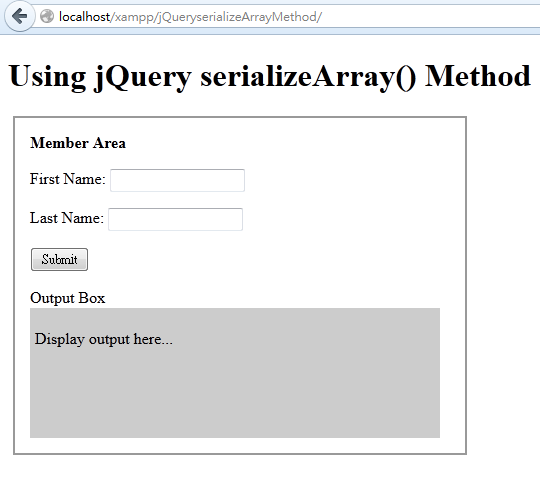 I will use the same form in the post – Using jQuery serializeArray() Method. Here’s the codes of PHP file (member.php) that process the serializeArray() object. This should be very easy as the serializeArray() object is in name/value pair format. Open the webpage and test. The First Name and Last Name send back from the external PHP file, and display on the webpage.